0 Comments Published by KL Ocs Kid on Friday, August 24, 2007 at 3:14 PM. Gabriel Heinze says he decided to move to Real Madrid as he did not want to cause any more controversy with Sir Alex Ferguson. The Argentine defender is set for talks with Real after the Spanish giants agreed a deal with United for the player just 24 hours after the Premier League blocked Heinze's move to Liverpool. 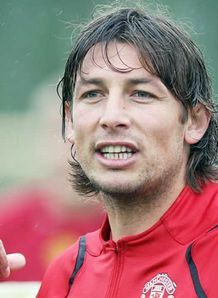 Heinze had been hoping to secure a switch to Liverpool after Rafa Benitez made a move for the tough-tackling player. The South American's stance upset Ferguson who was adamant the former Paris Saint Germain star would not be allowed to join their bitter rivals. After failing to secure his move to Anfield by going down the legal route, Heinze has now decided to move to Spain and he thanked Benitez for pursuing his signature. "It has been complicated. I am convinced my move to Liverpool would have worked out and I believe I had a case and needed to defend my rights," Heinze told the Daily Mail. "I am grateful for what Rafa Benitez said and tried to do. "I didn't want more controversy with Sir Alex Ferguson. "It is logical now for me to make this jump. "I always said I wanted to leave for one of the big clubs in Europe and Real are one of those."